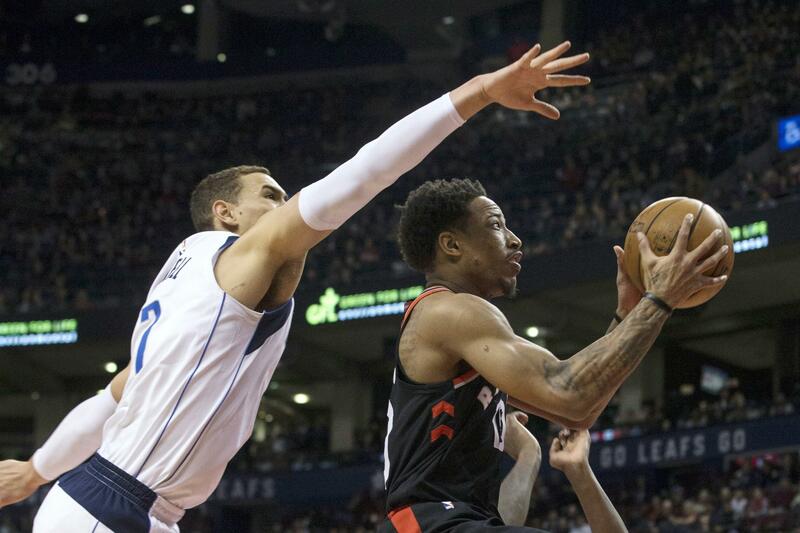 Fri., March 16, 2018, 10:45 p.m.
TORONTO – DeMar DeRozan made the game-winning basket in overtime and the Toronto Raptors rallied to match the longest winning streak in franchise history, topping the Dallas Mavericks 122-115 on Friday night for their 11th consecutive win. DeRozan scored 29 points and Jonas Valanciunas had 21 points and 12 rebounds as the Eastern Conference-leading Raptors (52-17) won for the 18th time in 19 games. Delon Wright had 15 points and Fred VanVleet scored 14, helping Toronto improve to an NBA-best 29-5 at home. Dallas had won three of four. Harrison Barnes scored 27 points for the Mavericks, and Dennis Smith Jr. had 19. OAKLAND, Calif. – Buddy Hield made three free throws over the final 27.5 seconds, Willie Cauley-Stein had a late dunk and Sacramento won on Golden State’s home floor for the second time this season. Hield finished with 22 points, seven assists and seven rebounds. Quinn Cook scored a career-high 25 points on 10-for-13 shooting for Golden State, making his initial seven shots and also hitting a career-best five 3-pointers after Kevin Durant was lost to a broken rib in a discouraging pregame announcement for the defending champions. OKLAHOMA CITY – Corey Brewer scored 22 points to help Oklahoma City to its fifth straight win. Oklahoma City’s Russell Westbrook had 16 points, 10 rebounds and 11 assists for his 22th triple-double of the season and the 101st of his career. Paul George scored 19 points and Steven Adams added 18 points and 14 rebounds for the Thunder, who swept all three games from the Clippers this season. Tobias Harris scored 24 points and Austin Rivers added 23 for the Clippers. DeAndre Jordan had 11 points and 21 rebounds. PHILADELPHIA – Joel Embiid had 24 points and a career-high 19 rebounds on his 24th birthday, leading the 76ers to the victory. LOS ANGELES – Goran Dragic scored 30 points, including a go-ahead jumper in the final seconds, and Miami snapped a nine-game road losing streak. Miami trailed 91-90 after Kyle Kuzma made a 3-pointer for Los Angeles with 1:23 left. But Dragic got the lead back for the Heat with about 15 seconds remaining and Isaiah Thomas missed a 10-foot fallaway jumper at the buzzer for the Lakers. Kelly Olynyk scored 17 points for Miami. James Johnson had 12 points, and Bam Adebayo added 11 points and eight rebounds. Julius Randle led the Lakers with 25 points and 12 rebounds. ORLANDO, Fla. – Terry Rozier and Greg Monroe each scored 17 points, helping the Celtics to the road win. Boston opened a 24-point lead early in the second half. Rozier hit a pair of 3-pointers and Monroe overpowered Nikola Vucevic for another driving layup to make it 62-38 with 5:25 left in the third quarter. Published: March 16, 2018, 10:45 p.m.